2008 July archive | YORK BLVD. Finally the Yorkblvd world tour is over. It spanned 4 continents, 15 time zones, and over 14,000 miles of air travel. The “Carne Asada is Not a Crime” TShirts have been sported from Thailand to Toledo (Spain) and despite the culinary adventures, the first thing either of us did upon returning was grab a genuine HP burrito. I was even greeted by our fair city with a 5.8 earthquake while I was still in the airport. (It must have been an even more fitting welcome for the French girl in front of me on our flight. She was preparing for her LA trip watching Menace II Society. Talk about stereotypes.) Of course, only our mothers are really interested in our travels so we’ve spared you the details, which explains the sporadic nature of our posts this summer. The only local news we have for now was a nice note from Anya and Matt, the owners of the soon to open Cafe de Leche who promise, “We’ll be featuring organic and fair trade coffees and teas and some fantastic pastries” for their late summer debut. We’re looking forward to it guys! On the off chance you want to see some street food pics from Spain and Morocco, check out our sister site at www.saveourtacotrucks.org. At long last, Highland/Glasell Park soccer-moms can get their ubiquitously bitter coffee without having to drive all the way to Eagle Rock. Yes, Starbuck’s, with its 15,000 stores in 44 countries has finally deemed us worthy of their coffee. Technically, I believe the address is in Glassell Park, but I wouldn’t have believed anyone who told me York Blvd. 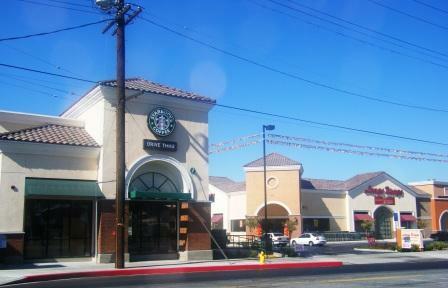 would have a Starbucks in the foreseeable future. Let’s hope the new Cafe de Leche isn’t run out of town by the 1,000 lb gorilla that is Starbucks. Beyond a coffee shop that I don’t plan on ever visiting as I’d rather give my money to Miguel at Antigua or the guys at Casa Blue (which isstill open), Occidental Plaza is also sporting a Long’s Drugs that is already open, and an L&L Hawaiian Plate Lunch joint that actually has potential of receiving my business. Back in college, when I was a frequent visitor to our youngest state (for reasons I can’t disclose as I value my current relationship) Plate Lunch was a delicacy of the Hawaiian hoi polloi that I couldn’t find on the mainland. Now, these places proliferate, but it’s still nice to have one nearby. Personally, I’m looking forward to the Korean spare ribs, chicken katsu, and mac salad. Based on a recent drive-by, it looks like L&L and the Starbucks are opening imminently. 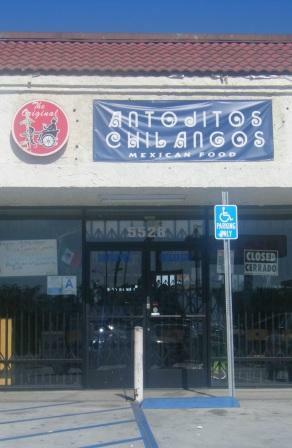 The specialty of Antojitos Chilangos has to be their panbaso. This large sandwich starts with a salty bolillo roll that is dipped in a mildly spicy red sauce. The roll is then filled with potatoes, chorizo, lettuce, and cotija cheese. Sprinkle a little salsa on top and gorge (with a fork and knife to keep your hands clean). In true D.F. fashion, you can also grab some tacos de canasta filled with either beans, cheese, or chicharron. I’m not sure if these are authentically cooked in a basket as they are in Mexico, but they are an excellent small appetizer, which is important here as they really take their time bringing out the panbasos. If you’re so inclined, Antojitos Chilangos also serves a filling gordita, and some fruity liquidos with bananas and strawberries that make for a nice refreshment on these hot summer afternoons.